On December 5, 2014, NASA’s new Orion spacecraft successfully completed its first test flight. Recognized as the beginning of a new era of space exploration, the flight is the first in a series of launches planned to lead humans to an asteroid, and eventually on to Mars. NASA hired Orion Management to install the AV system for the Orion Test Launch and Control Center, using a DVIGear MXP Series 33x33 digital matrix switcher as the AV backbone of the command center. The Orion spacecraft was built by Lockheed Martin, NASA’s prime contractor on the project. In the course of Exploration Flight Test 1 (EFT-1), Orion reached an altitude of over 3,600 miles. During re-entry, Orion sped through the atmosphere at about 20,000 miles per hour, generating temperatures of over 4,000 degrees Fahrenheit around the heat shield. This flight was the first step in a series of missions intended to prepare for manned expeditions into deep space, and along the way, the Orion team gathered data in order to validate designs and prepare for the objective of sending astronauts to Mars. During this mission, the Orion Test Launch and Control Center was the central hub overseeing the flight operations of the spacecraft. Lockheed Martin subcontracted Springfield, VA-based Orion Management to design and install the AV system for this command and control center. The application requirements included a wide variety of video formats, from standard broadcast video to Ground Support Equipment (GSE) video streams. The system design also required that outputs be divided between two separate locations to allow users in one area to share their console images with other engineers elsewhere for review and collaboration in real time without leaving their own consoles. Orion Management’s team of security system integration experts branched out into new ground when designing this control center. To complete the mission, Orion’s team sought out a supplier with control room experience that could not only provide the required equipment, but also join their team as a collaborative partner that would serve as a resource for AV knowledge. Orion Management ultimately chose DVIGear's MXP Series 33x33 digital matrix switcher as the AV backbone of the command center. The modular construction of the MXP Series switcher allowed the team to configure the AV signal distribution system to exactly fit the client's needs while still allowing for future flexibility. The switcher controls the rest of Orion’s installation at the control center, consisting of a Mintronix MP5000A touchscreen display; a Kramer VS-828 audio/video matrix switch; Bogen CSD1X2VR/U ceiling mounted speakers with Bogen HTA125 amplifiers; a Lantronix UDS1100 RS232 to ethernet converter; and a Firebird DCT-210 video tuner/converter with an HDMI output. 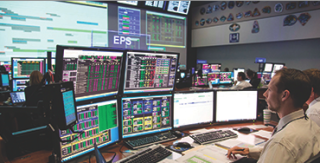 Through this setup, engineers monitoring the equipment on the spacecraft can share information with each other using the touchscreen, even if the receiving screen is in another room. “This is more than just trying to send one video to another screen,” said Cicirelli.